Dunkin’ continues its “America Runs on Dunkin'” campaign with a new installment, focused on the chain’s long history. The spot, set in the 1400, features the passengers of a wooden ship sailing in the ocean and dreaming of running on Dunkin’. One of them actually reveals he’s upset because there’s no such thing like Dunkin’ yet. The captain says it’s because they haven’t found a new land to proclaim their independence, turn their principles into law, design a flag, expand to West, open the first Dunkin’, franchise it and “fuel everyone with delicious coffee both hot and iced”. At this point, a bell rings, announcing the arrival of a man who brings over a tray filled with some Dunkin’ prototypes for the captain and his crew to sample. A crew member believes the donut and the coffee are “sensational” and wonders if the nation they could come across could run on those products. 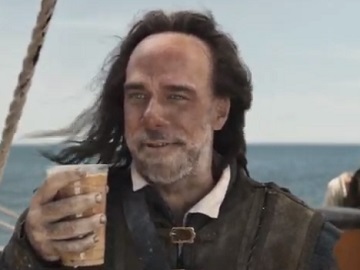 The captain assures him they will be running on Dunkin’ soon enough, provided they don’t sail off the edge of the Earth. The commercial ends with the voiceover saying “America’s Coffee From the Beginning” and adding the tagline “America Runs on Dunkin'”. The “America Runs on Dunkin'” national marketing campaign debuted in April 2006 and focused on American values of hard work and fun. To celebrate Valentine’s Day, the multinational coffee company and quick service restaurant introduces new Bling Sprinkles Donuts and its first donut featuring a perfect pairing of two favorite fillings, along with the return of heart-shaped donuts. In addition, for Vegas Valentines, on February 9, from 11AM to 3PM, Dunkin’ will offer the first 100 couples that stop by Sure Thing, a Wedding Chapel by Flora Pop, in Las Vegas, custom donut bouquets for their ceremony. Founded in 1950, by William Rosenberg in Quincy, Massachusetts, Dunkin’ Donut, subsequently rebranded as Dunkin’, has become one of the largest coffee and baked goods chains in the world, having nearly 12,000 locations in 36 countries.